An exciting travelling exhibition outlining archaeological research in the Ballyhoura Hills area was launched yesterday, Tuesday 19 March, in Kilmallock Library. The exhibition focuses on Bronze Age farmers, Iron Age frontiers and the medieval friars, reflecting the research projects carried out in the area by The Discovery Programme: Centre for Archaeology and Innovation. The Discovery Programme: Centre for Archaeology and Innovation Ireland (www.discoveryprogramme.ie) celebrates its 25th anniversary in 2016 and our celebrations focus on engaging with the communities throughout Ireland that hosted our projects over the years and also by advocating the intrinsic value of our rich heritage of archaeology and history to modern Irish society. This initiative links with the Discovery Programme’s current strategy of enabling people to become the custodians of their own landscapes and of creating a vibrant community of scholars to interpret these landscapes. 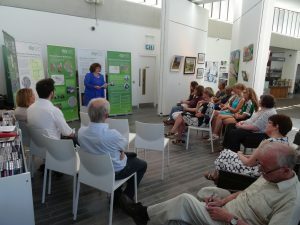 Margaret Keane, Senior Archaeologist with the National Monuments Service, Dept of Arts, Heritage, Regional, Rural and Gaeltacht Affairs and Member of the Discovery Programme Directorate launching the exhibition. The Ballyhoura Hill project was one of the first projects undertaken by the Discovery Programme and it aimed to identify new archaeological sites of Bronze and Iron Age date (4500 to 2400 years ago). It also set out to test a number of new survey methods in Irish archaeology and to determine how they could best be used together. The Monastic Ireland project also carried out research on medieval monasteries in the region and that project’s research on Kilmallock Dominican Priory is another strand in this exhibition (www.monastic.ie). This exhibition Farmers, Friars and Frontiers: the archaeology of the Ballyhoura Hills aims to communicate the results of this research in an accessible and engaging manner. The exhibition, organised with the assistance of Ballyhoura Development, will be on display in Kilmallock Library until 29 July. From there it will move to the Tearooms at Doneraile Wildlife Park, where it will be on display between 29 July and 15 August. Finally it will move to Kilfinane Library where is will be in display between 16 and 30 August. As the aim of the exhibition is to create local awareness of the region’s archaeological heritage and the Discovery Programme’s research we targeted venues that local people would visit regularly. The launch took place in Kilmallock Library on Tuesday 19 July 2016. It will be followed by a walking tour of the priory in Kilmallock and concluded with refreshments in the Deebert Hotel.